If you have tried multiple screenshot programs but not fully satisfied with them, you may want to give this tiny snapshot program a try if it can help you better. 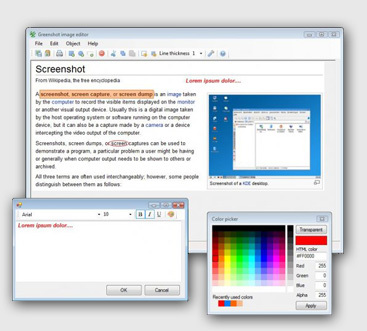 Named as Greenshot, it is one of the simplest but yet very useful screenshot targeted for those Windows PC users that need a much quicker way to print screen and add some color texts onto it. As the name implies, the specific area will turn green once it is selected that allows users to take next step to either edit it, add annotate before being saved or shared to others. The major advantage of this tool is there are multiple hotkey combinations that enable a much simpler and quicker screenshot solution as compared to the rest such as FSCapture and etc. For instances, users can capture region by tapping on PrtSc key, capture window using Alt + PrtSc key or capture full screen using Ctrl + PrtSc. The software utility can be put in the system tray and right clicking on it will bring up the simple setup interface with a way to select the screenshot destination as Image editor, Clipboard, File and etc on top of the ability to configure the image format as famous JPEG, PNG, GIF or BMP. When JPEG format is selected, users can even choose to reduce the the JPEG quality to conserve memory usage just in case there are too many snapshots to be taken on a memory space constraint PC system. Regardless of its usefulness, the software utility is very tiny and consumes around 400kB of your hard disk space. Users can get a free download at Greenshot.